As noted in part one, Nevada has had the dubious distinction of being the subject of a number of misguided scientific claims. There also have been hoaxes of a more deliberate kind, most concocted by 19th century Nevada newsmen. 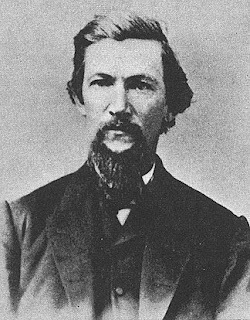 One of the most famous tall tales was concocted by legendary Virginia City journalist William Wright, who worked at the Territorial Enterprise and wrote under the name, Dan De Quille. De Quille described how the man would set the stones on a floor or table in a circle and the rocks would begin moving toward each other. He speculated that the stones probably rolled together because they were made of loadstone or magnetic iron ore. The story was copied by newspapers all over the world and generated a flood of letters from people curious about the strange rolling stones. De Quille reported that P.T. Barnum wrote to offer $10,000 if the rocks could be coaxed into performing under a circus tent. In 1879, De Quille finally tired of the story and wrote a short article in the Territorial Enterprise that exposed his duplicity. Bizarrely, many refused to believe the retraction. De Quille crafted other, less famous hoaxes during his many years as a Comstock reporter as did one of his Territorial Enterprise co-workers, Samuel Clemens, who is more widely known by his nom de plume, Mark Twain. One of Twain’s best-known hoaxes was the story of the petrified man. Angry with a Humboldt County coroner for some slight, he wrote a story about the coroner finding a petrified man who seemed at least 300 hundred years old. He wrote that rather than leaving the man in peace, the coroner decided to summon a jury and conduct an inquest into the cause of death—even though the man was three centuries old. The story was clearly satire, written with plenty of absurdities, yet many believed it and it was reprinted in papers throughout the world. Twain later wrote that he gained much secret pleasure in the fact that the coroner was inundated with mail from folks asking about the famed petrified man. A hoax not created by a newsman but conceived by a commercial enterprise was the legend of the Maiden’s Grave. Promotional materials distributed by the Central Pacific Railroad told of a large cross on a hillside near Beowawe that commemorated Lucinda Duncan. The story said that she was a courageous, young Missouri woman who grew sick and died while crossing Nevada by wagon in the mid-1860s. Other evidence, including emigrant diaries, indicates that Lucinda Duncan was probably a 70-year-old grandmother who died in 1863 of a heart attack while traveling to California. The big white cross is still there and people continue to repeat the much sexier story of the young maiden who died while traveling across the harsh Nevada landscape. At the end of the classic western film, “The Man Who Shot Liberty Valance,” a newspaper editor tells a young reporter that when the legend becomes fact—print the legend. Did you know that Nevada was the site of the Garden of Eden or that giant, red headed Indians once hung out near Lovelock? Over the years, Nevada has been the subject of a number of outlandish claims. Some of the bizarre pronouncements have been the result of honest scientific miscalculations while others have been the work of more misguided individuals. 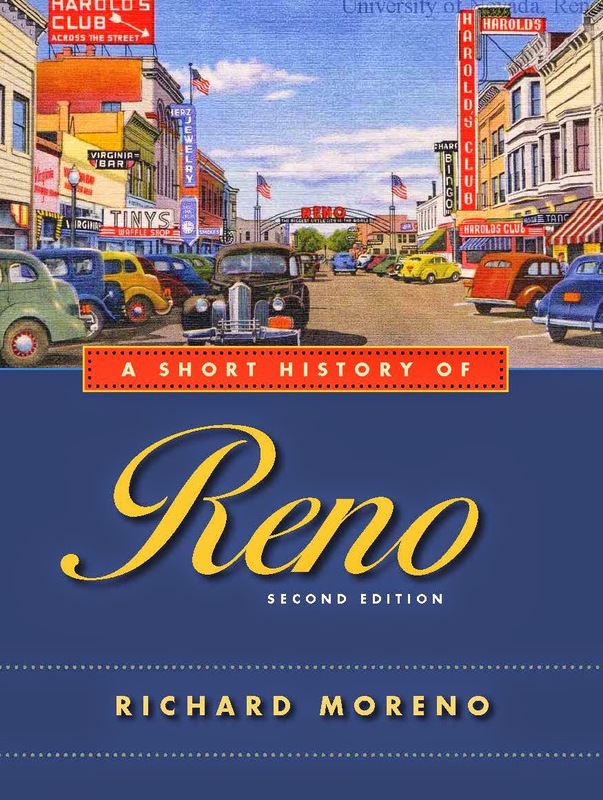 In the 19th and early-20th century—when most of these claims were perpetrated—it was perhaps easier to convince people of their veracity because most folks knew so little about Nevada. 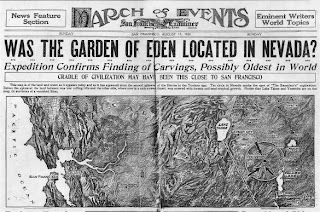 One of the most unusual claims was one made in the 1920s when a San Francisco newspaper announced that the Garden of Eden had been found in Nevada. On August 17, 1924, the San Francisco Examiner reported on its front page that archaeologist Alan Le Baron had found the birthplace of mankind on a barren hilltop 30 miles south of Yerington. For a week, the newspaper printed exclusive reports from the location that stated Nevada was the site of the creation of mankind. Proof, according to the paper, was the existence of rock art that appeared related to—and possibly predated—Egyptian hieroglyphics. The articles referred to the site as the “Hill of a Thousand Tombs” and included photos of carvings depicting bighorn sheep, snakes, birds and other shapes. Additionally, Le Baron claimed to have found the bones of elephants, lions and camels mingled with the petrified remnants of a million-year-old forest. Other experts, however, studied the site and determined that the “hieroglyphics” were Native American petroglyphs. They concluded that Nevada was a nice place—but certainly not the Garden of Eden. Another noteworthy hoax was the evidence showing that giants once lived near Carson City. Proof of this claim surfaced in the late 1870s, when inmates at the Nevada State Prison discovered footprints that some experts said were made by prehistoric giants. The inmates had been cutting stone in the prison quarry when they found a large number fossils and a trail of large footprints in the rock. The California Academy of Sciences in San Francisco sent a team of experts to study the site. While the group concluded that the intriguing prints were most likely made by animals about a million years ago, a few scientists reported that they believed the prints were made by a prehistoric race of giants. They based their findings on the fact that the prints appeared to have been made by a two-legged creature wearing large wooden sandals. The prints were thought to be human because they curved like a human foot. Other researchers studied the prints and came to a different view—the prints were made by a giant sloth. The controversy rages for nearly 50 years before paleontologist Chester Stock, who excavated the Rancho La Brea tar pits, studied the prints and said they were identical to sloth prints found at La Brea. Yet another “Land of the Giants” theory gained notoriety during the 1920s and 30s when John T. Reid, a mining engineer and avid amateur anthropologist, found bones in the vicinity of Lovelock, which he told local newspapers were from a race of giant, redheaded Indians. Reid had heard Paiute stories about tall, redheaded cannibals, said to have lived near Lovelock Cave, so when he found red-haired skeletons he assumed he’d discovered the remains of the legendary giants. He measured the bones and calculated that when alive the people had been between seven-feet, seven-inches tall and nine-feet, six-inches. The bones became lost for several decades—during which time the legend of the redheaded giants grew—before surfacing again in the late 1970s. An analysis showed that Reid had incorrectly measured the bones, which were actually from normal-sized people. Additionally, the red hair was the result of discoloration caused by natural deterioration of the bodies as well as dyes used by Great Basin tribes during preparations for burials. In other words, the bones were not of red haired giants. More great Nevada hoaxes next time.